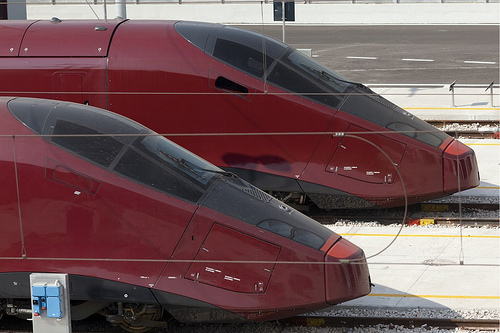 As Europe's first privately owned high-speed train hit 300 kph just outside Naples, Ferrari chairman Luca Cordero di Montezemolo smiled at the suggestion that he was addicted to risk and velocity. "Yes," he said. "Yes, speed and risk, risk in terms of economic risk. I think an entrepreneur has to risk, if not, he is not an entrepreneur anymore." Montezemolo and a consortium of private investors are taking a 1 billion euro ($1.3 billion) risk that they can provide better high-speed train service between major Italian cities than state-run Trenitalia, taking advantage of a 2006 European Union move to open up track to competition. "We have brought an end to one of the longest monopolies in the history of our country. Finally, Italian travelers and tourists can choose," he said. The new company, called NTV, or Nuovo Trasporto Viaggiatori, starts service between Rome and eight other Italian cities on April 28 and will eventually have 25 trains. Montezemolo and businessmen Diego Della Valle of luxury goods maker Tod's, Gianni Punzo and Giuseppe Sciarrone founded the startup in 2006. They were later joined by Banca Intesa San Paolo, Italy's largest insurer Generali, businessman Alberto Bombassei from Brembo brake company and French state railway company SNCF, which took a 20 percent stake and provides know-how. But Montezemolo, chairman of NTV, is clearly the leading man in a high-profile business script aimed at snatching 25 percent of Italy's high-speed train market by 2014 and breaking even the same year. It hopes to attract 8-9 million passengers a year by then. Chiara Pelizzoni, a transport analyst for Nomisma, said NTV will not have too many problems attracting customers in the high-speed market. "The high end of the market will be easier to sell. There are customers willing to pay for good services and from an industrial plan point of view they have a good, experienced partner in SNCF," he said. "The real challenge will be if they try to enter the market for regional routes, where it is much more complicated to make money and where there are more regulations," she said. Montezemolo, who looks younger than his 64 years, has a breathless business resume and aristocratic family lineage that fuels his confident, can-do style like high-octane petrol fuels a Ferrari. He organised the 1990 World Cup football tournament, was chairman of carmaker Fiat, managed Italy's America's Cup sailing race challenge team, headed the powerful business lobby Confindustria and is now running Fiat's Ferrari division .